At this point, we have a good idea of what games on your phone will play like: a simple concept that has the capability of being exciting and engaging for the short amount of time you spend with it. The basic concept of Extreme Road Trip 2 is that you are driving, but your pedal is glued to the floor and you must get as far as you can without crashing. This is made more complicated by a Happy Wings style course laid out in front of you as you drive left to right, over hills and valleys, collecting coins and fuel, smashing boxes (which usually have items like boost in them), and running over pretty much everything in sight. The only things keeping you from ending your streak is your fuel gage (barrels are picked up throughout the level) and your own ability to make sure the car lands on it’s own two tires. 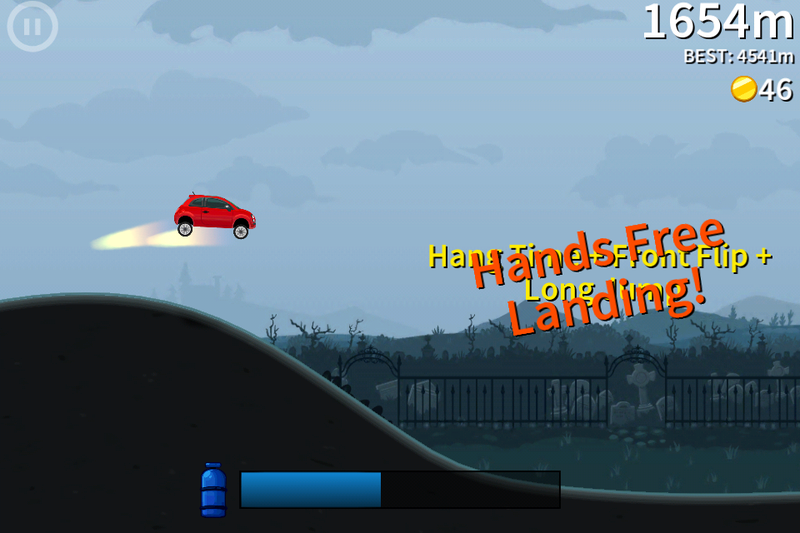 Tap left on the screen, and your car will lean back while in air; the same applies for right. If you press both sides at the same time, you will do a “slam” where you come straight down, maintaining whatever sort of spin you had in the air. There is no real way to “win” that I have discovered; you just go until you can’t go any farther, at which point your distance becomes the thing that gets thrown up onto the scoreboard. Unlock All The Things in Extreme Road Trip! Doing well each run allows you to advance further into additional features of Extreme Road Trip 2. 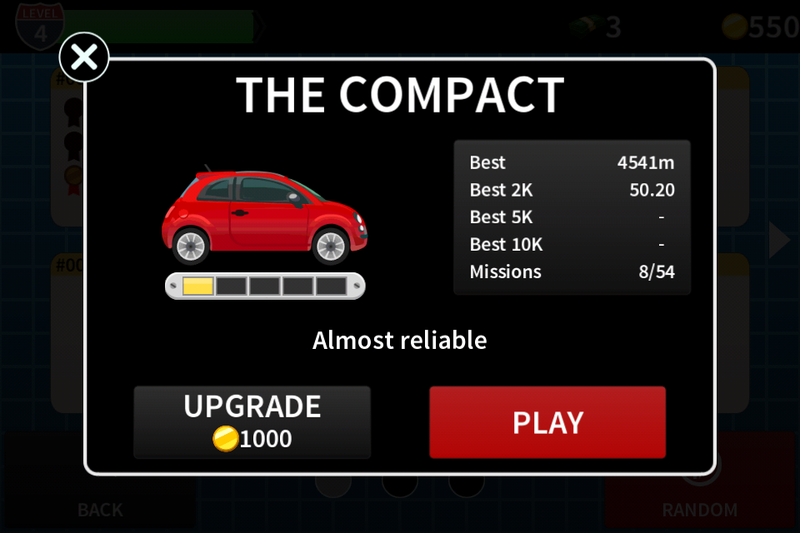 With coins that you won on a run, you can buy more cars that maneuver differently or choose to level up a current car further. 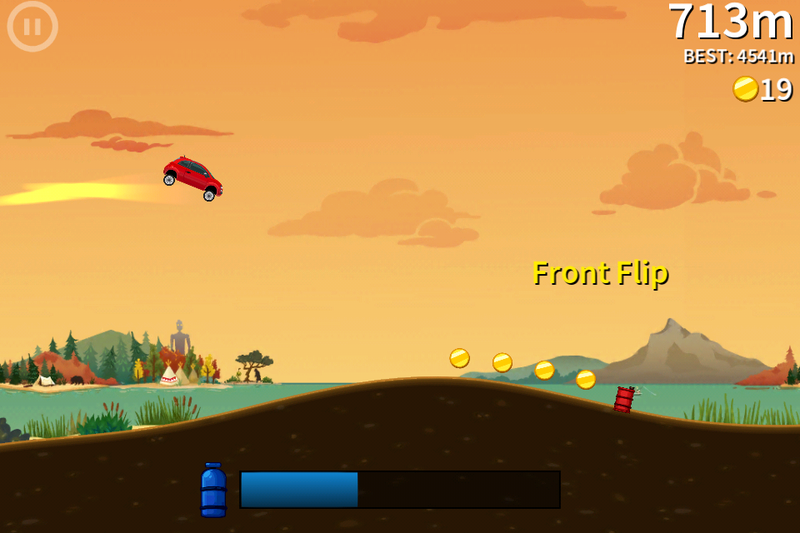 At the end of each attempt you are shown how far you went, your highest record so far, the coins you collected in the run, the number of stunts you did, and current missions. 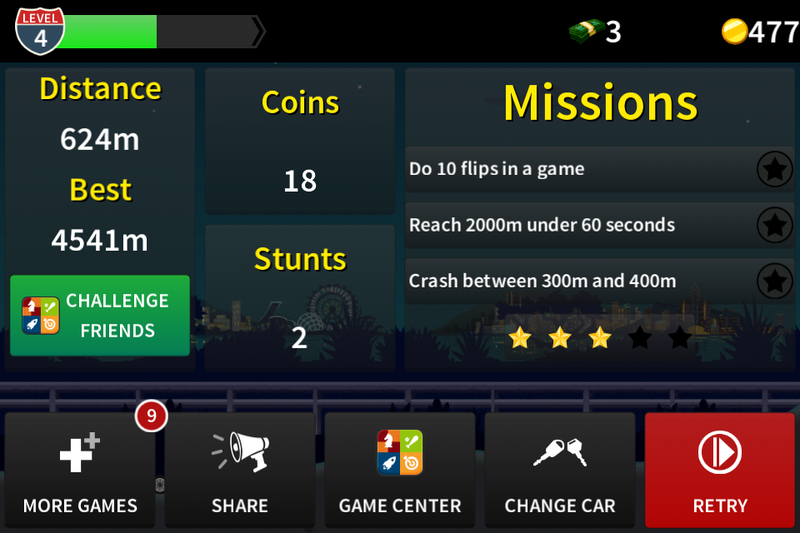 The missions are tasks like “Do 10 flips in a game” and “Reach 2000m under 60s”. Each mission you complete earns you a star, which is shown underneath the missions. When you reach five stars, a window pops up with two boxes for you to smash and collect a random prize, ranging from dollars (used to unlock some of the cars) and coins to boost and the like. Above all of this is your current level, with a bar to fill up (which I wager fills up depending on a combination of how far you went, how many coins you got, and all the stunts you pulled off). If all of these sound familiar, you know what to expect from Extreme Road Trip 2, as it’s an excellent execution of all these mechanics. Presentation-wise, the game is pretty slick. There are a couple of different environments to drive through, all well illustrated. The animation is smooth, running on an iPhone 4S. At one point I was going at such a speed that I hit a jump and went flying so high into the air that the camera had to pull back far enough that I had trouble seeing my car, even with a retina display, which wasn’t damaging to the experience in any way, but is worth mentioning. The music is a spunky mesh of current pop music auto-tune applied to bleeps and bloops we normally associate with video games. It’s peppy and fun, but it’s no Pacman Championship Edition DX in terms of memorable game soundtracks.They’re on the right path though. Though it doesn’t do too many new things outside the mold, Extreme Road Trip 2 is a better than average iPhone game, and an excellent way to while away the bus ride. On several occasions, I managed to get engrossed enough to lose track of the time (the hallmark of any good phone game!). We can all thank Free App a Day for bringing this to the masses for the wonderful price of zero dollars, so get Extreme Road Trip 2 while it’s hot! I think that the game is quite good. I am very lucky to find your website and get great ideas regarding these topic. Hope to read more from your blog.